Welcome to Reception! Croeso i ddosbarth derbyn! We have created a space station and a hospital in our classroom. We are enjoying taking on the role of doctors, nurses, and patients in our children's hospital. In the space station we are astronauts flying to outer space counting down from 10 as our rocket launches. To celebrate Guy Fawkes Night we made fireworks and created pictures of the fireworks in the sky by splatter painting and using tools on our Smart Board. We loved getting messy!!! We had a fun day raising money for Children in Need. Look at these pictures of us all laughing and raising money for such a good cause. We read the book 'Whatever Next.' With props we pretended we were Baby Bear flying to the moon in a rocket, having a picnic and flying back again. We engaged in talk with each other to tell the story. We have visited the new Rumney library. We were told a story about a penguin. We then created our own penguins using different shaped coloured paper and glue. We were allowed to choose a book each to take back to school and share with each other in our book corner. It was great fun! Look at us during our Christmas Concert. Didn't we do well!! Fran from Up Beat Music is teaching us how to keep a beat. We are having such a good time singing and using percussion instruments. We have been experimenting how to make a toy car travel faster and further. We recognised the need for a slope and a big push!!! 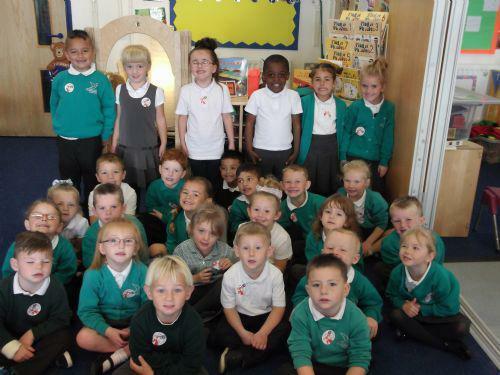 The dental nurse visited the Reception class to talk to us about how to keep our teeth healthy. We learnt that we should brush our teeth twice a day, eat food without sugar and visit the dentist regularly. We were shown how to brush our teeth properly. It was great fun! Play continues to be a very important part of how we learn. Look at these photographs of the children engaged in learning, interacting and having fun.